Chuichi Nagumo was born in Japan in 1887. He joined the Japanese Navy and eventually became commander of the Japanese 1st air fleet. A strong supporter of the integration of air and sea power, Nagumo was the director of the air attacks on Pearl Harbor on 7th December, 1941. Nagumo also organized the bombing raids on Australia, Ceylon and India. After the loss of four aircraft carriers at Midway Nagumo was demoted and was given command of a small naval flotilla in the Marianas. 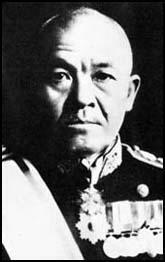 In 1944 Nagumo was given the task of organizing the defences of Saipan. Chuichi Nagumo committed suicide on 6th July 1944 during the later stages of the Allied conquest of the island.